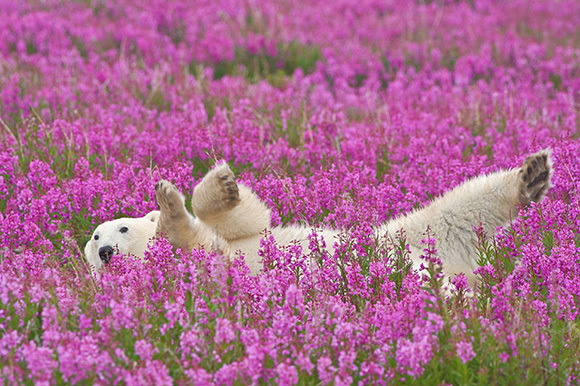 This polar bear has been watching The Jungle Book too often as this series of stunning photographs captures him kicking back and relaxing in a bed of flowers – and trying a few. 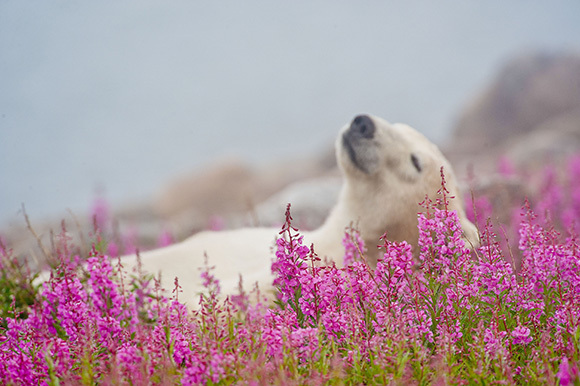 Just like the Bear Necessities as sung by Disney favourite Baloo, this polar bear forgot about his worries and his strife – by lounging around with his legs in the air on this island in Hudson Bay, Canada. The pictures were captured by granddad-of-two Dennis Fast, 72, on a tiny 1km wide island who claims he had to pinch himself when he saw the bear playing. The retired teacher had to meticulously plan the shoot for YEARS as due to the island being so small it could result in an over-eager photographer having no escape if a bear turned aggressive.